Sometimes, you need a reminder to do something involving another person — but tying a string around your finger looks silly and doesn’t help much anyway. Microsoft Outlook 2019 offers a better way. For example, if you promise to call someone next week, the best way to help yourself remember is to flag that person’s name in the Contacts list. A reminder will pop up in your Calendar. Contacts aren’t the only items you can flag. You can add reminders to tasks, email messages, and appointments to achieve the same effect. If you are still in List view, you might want to change back to Business Cards view for these steps. 1. In the People module, right-click on the contact you want to flag. The Follow Up menu appears, as shown here. 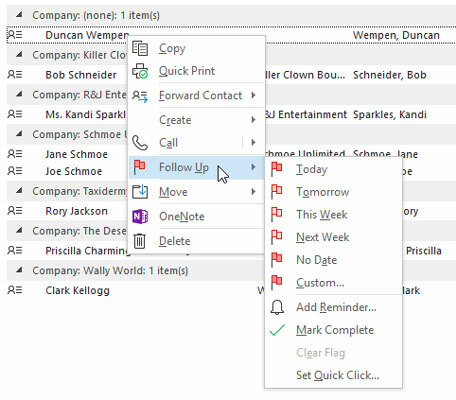 Right-click on any contact to add a flag. 3. Click the date you plan to follow up with the contact you chose. Your choices include Today, Tomorrow, This Week, and Next Week. Sadly, When Heck Freezes Over isn’t an option. 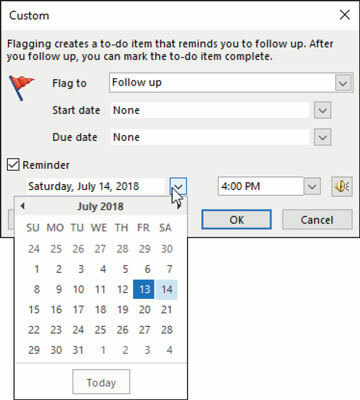 Flagging a contact for a specific day makes that contact’s name appear on your Outlook Calendar on the day you chose. 4. Right-click the contact again, point to Follow Up, and then click Add Reminder. The Custom dialog box opens. This is an optional step, but this makes a reminder window open and play a sound at the time you choose — just in case you have big reasons to avoid talking to that person. A reminder is Outlook’s way of telling you to get it over with. 5. In the Custom dialog box, Open the Date drop-down menu in the Reminder section and choose a reminder date. Clicking the arrow next to the date opens a calendar date picker, as shown here. Click the desired date. 6. Open the Time drop-down menu and choose a reminder time. You can customize the sound that plays by clicking the speaker icon to the right of the time. 7. Click OK to set the reminder.